A local student accumulated an impressive total of six prizes throughout his time Bangor University during the last four years. Former Ysgol David Hughes pupil, Daniel Congrave, 22, from Beaumaris, Anglesey graduated this week with a Master of Chemistry degree (MChem). Daniel was awarded the Dr John Robert Jones Prize which is awarded to three of the best graduates across all subjects at the University, and received a Prize of £800. He also won the AMRI MChem prize of £250, which is an annual award for the best MChem final year student. Back in 2010, Daniel was awarded a Bangor University Excellence Scholarship of £3,500; an annual award presented to first year students who obtained the best A-level grades. This was soon followed by the School of Chemistry Achievement Award of £500 in 2011, which is presented to the first year student achieving the best examination results during the first semester. At the end of his first year, he scooped the Arthur Morris Centenary Prize of £50, awarded to the best first year chemistry student. At the end of his second year, Daniel was awarded the Evan Roberts Prize of £100, an annual prize presented to the best second year chemistry student. Relieved to be graduating, Daniel said: “It’s been a long four years as I did Summer internships at the School of Chemistry at the end of both my second and third years. Combining that with the requirements for revision over Easter and Christmas, I haven’t really had a chance to relax properly for a while. It’s nice to have a break before I commence my PhD in October, although I’ll hopefully get a chance to do some voluntary research at the School in August. “Whilst at school, I was always interested in making things and was sure that I’d want to be an engineer when I grew older. However, I performed well in maths and the sciences, so decided to pursue chemistry at university. I love it as it involves engineering, which is making things, but on a molecular level. “I chose Bangor because the class sizes appeared to be quite small compared to the other universities. The small class sizes allowed me to develop a more personal relationship with the staff and afforded greater opportunity to ask questions and further my knowledge. “I worked over the summer of both my second and third years at the University to gain research experience. I found this invaluable, and it was very nice to get paid for something which I enjoy so much. At the start of my fourth year I also helped third year students a bit in the lab during my free time. “During the summer of the second year, I won an analytical chemistry trust fund summer studentship. I carried out some interesting environmental chemistry research to try and develop an electrochemical sensor to measure phosphate concentration in water samples. “I began my fourth year research project last summer, which involved the synthesis of organic materials for application in electronics, for example, transistors, displays, lighting such as OLEDs and organic photovoltaics or solar panels. I loved this research and will continue along a similar route during my PhD at Durham University this October. 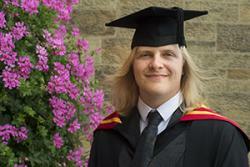 “The highlight of my course has been the last year or so carrying out research into organic electronics. This is definitely the area of chemistry which I am most passionate about and I am excited at the prospect of continuing my work within the discipline during my PhD. Following a nomination by his fourth year project supervisor, Daniel has been offered to attend The World Science Conference – Israel (WSCI) in Jerusalem at the end of August. Competition for places is very high and it gives young scientists the opportunity to be lectured by over 20 Nobel Peace Prize laureates. Only 13 students from the whole of the UK will be attending, representing all scientific disciplines. View a short interview with Daniel.